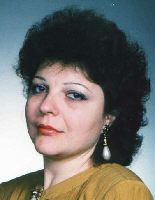 The soprano Maria Belcheva was born in Burgas on 6 April 6 1956. Her mother, Lilija Belcheva, was one of the founders of the Burgas Opera. In 1975 Maria graduated from the Secondary Music School Burgas in opera singing and continued her education at the State Academy of Music with Irena Brambarova. From 1981 to 1983 she attended the master level at the Academy. Her debut was as Santuzza with the Burgas Opera on 7 June 1981 and in 1983 she was invited to be a member of that company. In 1988 she left for Rome and specialized at the Academy for Music and Art with Boris Christoff. She debuted with the Sofia Opera on January 20, 1990 as Leonora in Forza del Destino and in 1992 was engaged as principal soloist for the main soprano roles. International appearances took her to Germany, France, Italy, Spain, Israel, Korea, Switzerland and Brazil. In 1990 she won the first prize and gold medal at the Mario del Monaco competition in Sicily. Along with her stage performances, in 1995 she began vocal teaching at the State Academy of Music. Major roles in her career included Tosca, Leonora, Aida, Desdemona, Turandot, Elizabeta in Don Carlo and Maria in the Bulgarian opera Tzar Kaloyan.